please join our mailing list below. We specialise in the design and installation of renewable energy systems for home and business to help reduce CO2 emissions. We work with individuals and professionals to deliver carbon-neutral systems specific to their energy requirements and a real alternative to their fossil fuel-powered equivalents. We work with the best manufacturers and suppliers across the industry to ensure our customers receive the most efficient and innovative products available. Whether you are interested in biomass (log/ chip/ pellet wood boilers or workshop heaters), heat pumps (ground or air source) or solar (thermal or photovoltaic) technologies, our expert team can help to design the right system for you. 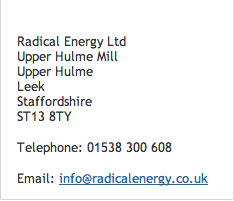 At Radical Energy we don't believe using renewable sources of energy should be difficult. Each of our installations is engineered with minimal maintenance in mind to give you, our customer robust, hassle-free operation. Please browse through our Grants/ Funding section to see how easy it is to make a green energy installation more affordable. You may be surprised to learn how quickly a system from Radical Energy reaches payback. We are both a MCS approved installer and bound by the Renewable Energy Consumer Code that is backed by the Trading Standards Institute so you can have peace of mind that whichever technology you decide upon you will recieve the very best service. Please visit the RECC website for further details of the Consumer Code. Why not take a few moments to try our simple Carbon Calculator to see how much CO2 savings you could make every year across each of the technologies we offer.